Can someone please clarify this? What do they mean by direction? If I have a one tailed distribution with the mean close to 0 and no negative values, then what exactly would "less" do and "greater" do? Here's an example of my frequency dist. 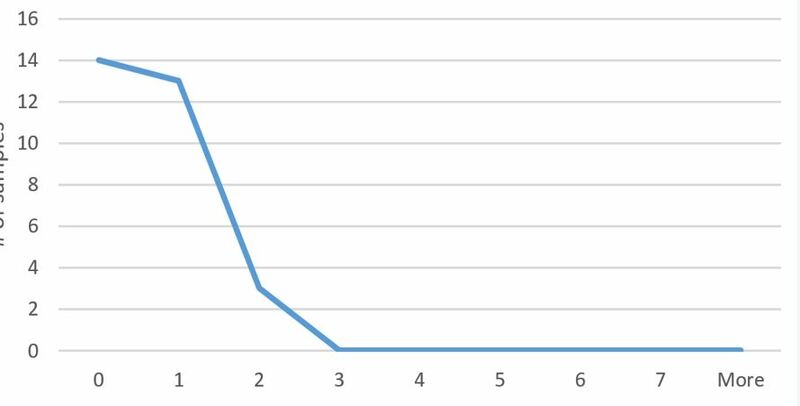 The x-axis is # of samples and y-axis is number of components of interest and each sample is an image. Fisher Exact Tests consider all possible permutations of $2 \times 2$ contingency tables. Each table permutation can be ranked in terms of its degree of association by considering the odds ratio. An odds ratio which is greater than 1 shows a positive association between an exposure and an outcome whereas an OR less than 1 shows a negative association. The null hypothesis of a two sided Fisher's Exact Test is that the odds ratio of outcome and an exposure is 1 whereas the alternative is that it is not 1. A single sided test has a null hypothesis that the odds ratio is either less than 1 or greater than 1. Not the answer you're looking for? Browse other questions tagged distributions statistical-significance mathematical-statistics python or ask your own question. Is it justified to use a one-tailed t-test if I my hypothesis is one-sided? How to make a two-tailed hypergeometric test? Two-tailed tests… I'm just not convinced. What's the point?